Poliomyelitis (po-lee-o-my-e-LY-tis), or polio, is a viral infection that attacks nerve cells and causes deterioration of muscles and sometimes paralysis. Remarkable photographs from the mid twentieth century show people—sometimes a large roomful—enclosed in metal tanks being attended to by nurses. The tanks were called iron lungs. In the 1940s and 1950s, these machines breathed for patients whose breathing had been either temporarily or permanently disabled by poliomyelitis. Once the most feared of childhood diseases because of its potential to cripple people for life, polio is now almost unknown in the United States. Elsewhere in the world, however, the disease still strikes thousands of people each year. 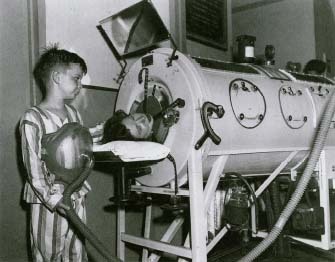 This photograph, taken in 1949, shows an 8-year-old boy with polio wearing the newly introduced one-pound portable "Monaghan" iron lung around his chest. He is standing next to an adult woman lying confined in an old-style iron lung. people, about 1 to 2 percent, the virus invades the central nervous system, that is, the brain and spinal cord, where it can cause paralysis. Depending on where the virus goes in the spinal cord, a person may also have difficulty breathing, talking, or swallowing. Poliovirus is special in that it attacks only the nerve cells that control muscles—called motor neurons—and leaves other nearby nerve cells unaffected. Nerve cells are like roads connecting our muscles to the central nervous system, and the virus is able to travel along these roads to the spinal cord and brain. The virus infects more than 95 percent of the motor neurons in the spinal cord and many other cells in the brain. The neurons that are destroyed cannot be replaced, and paralysis is the result. But many neurons survive, and when they recover, they form new connections to the muscles. In fact, for reasons that are not clear, a nerve cell that survives the virus sprouts many more connections to muscle cells than it did originally. So even if many neurons are destroyed by the virus, often the remaining neurons are able to make up for the loss. In more than 90 percent of cases, people do not know that they have caught the poliovirus. When symptoms do occur, they may be similar to those of a cold or the flu. Although paralysis is a devastating result of poliomyelitis, most people with polio do not become paralyzed. And many patients who do develop paralysis recover much of the use of their muscles weeks to months after infection. About two-thirds of patients with paralytic polio have long-lasting effects from the disease. Polio has caused paralysis and death for most of human history. Reference to paralytic poliomyelitis can be found in Egyptian stone engravings over 3,000 years old. At the start of the twentieth century, however, few people had ever heard of the disease until epidemics of polio began to occur with regularity in the developed world. In the summer of 1916, polio became a more familiar condition in the United States when a devastating epidemic struck New York. The out-break left 27,000 people paralyzed and 9,000 dead. Almost forty years later, on April 12, 1955, it was announced that Dr. Jonas Salk had developed the first effective vaccine against paralytic poliomyelitis. With the development of this and other later vaccines, polio has been eradicated throughout most of the industrialized world. How Do People Know If They Have Polio? Usually polio can be diagnosed by the kind of paralysis it causes—more on one side of the body than the other. A person cannot move his or her legs, arms, or even the muscles required for breathing. Tests identify cells in the fluid around the brain and spinal cord that are not supposed to be there. To confirm the diagnosis, samples from a throat swab and a stool culture are tested to see whether they contain poliovirus. There is an even more rapid and sensitive test, called polymerase (pol-IM-erase) chain reaction, that is used in some cases. Franklin Delano Roosevelt contracted polio at the age of 39 while vacationing on Campobello Island in New Brunswick, Canada. After a day of swimming and playing with his children, he went to bed tired and aching and awoke unable to move his legs. Two weeks later his illness was identified as polio. FDR never walked unassisted again. He had already begun a life in politics, and in 1932 he ran for president of the United States and won. Although FDR did not try to hide his bout with polio, he went to great pains to disguise the extent of his disability. The public never saw him in his wheelchair. In 1938 FDR established the March of Dimes, which funded the research and immunization effort that eliminated polio from the Americas. The Franklin Delano Roosevelt Memorial in Washington, D.C. FDR's pet scotty Fala sits at the foot of the wheelchair-bound president. 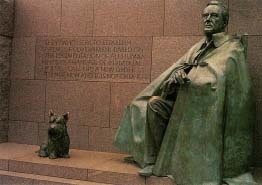 In 1998 the decision was made to add a sculpture of FDR in his wheelchair to the FDR memorial in Washington. Depicting him this way was controversial. Some people felt that he would not have liked being shown in his wheelchair in the sculpture. Others argued that he would be glad to have his image encourage people with disabilities to accomplish great things. There is no treatment for polio infection, but it can be prevented by vaccination. Vaccination is a way of protecting a person from a disease by introducing the body to a harmless form of the disease-causing organism. Then if the body encounters the disease-causing germ, it is able to recognize it and fight against it. In 1952 there were 57,879 cases of poliomyelitis in the United States—the highest number of cases ever. But the introduction in 1955 of an injectable vaccine developed by Jonas Salk and in 1961 of an oral vaccine developed by Albert Sabin ultimately eradicated poliovirus in the western hemisphere. The last cases in the United States occurred in 1979, among religious groups that had declined to be vaccinated. At present, the only cases of polio reported in the United States are due to the oral vaccine itself. Five to 10 such cases are reported each year. Most of the other cases develop in close contacts of these patients who have not been properly vaccinated or who have weakened immune systems. Of 6,241 polio cases reported from 51 countries in 1994, more than 7 of every 10 were from India, Pakistan, and Bangladesh. There are several reasons for these outbreaks: Many people live in unhealthy, crowded conditions, and they may be improperly vaccinated or not vaccinated at all. Jonas Salk was the head of the Virus Research Lab at the University of Pittsburgh when he began to study poliovirus. At first, Salk's work went slowly because it was hard to make enough virus to work with. But in 1948 researchers at Harvard University found a way of creating large quantities of virus, which enabled Salk to refine his vaccine. On July 2, 1952, he tried the vaccine on children who had had polio and recovered and found that their antibodies to the virus—proteins the body manufactures to fight against disease—had increased. Next he tried the vaccine on volunteers who had not had polio, including himself, his wife, and their children, and no one got sick. In 1954 mass inoculation of schoolchildren was begun and resulted in 60 to 70 percent prevention. Between 1955 and 1957, the annual number of new cases of polio in the United States decreased from 28,985 to 5,894. 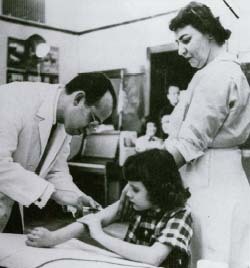 A school nurse stands by on March 10, 1954, as Dr. Jonas Salk injects an 8-year-old Pittsburgh schoolgirl with polio vaccine, still experimental. The March of Dimes helped fund the first trials in Pittsburgh, where Salk was based. Guidelines of the U.S. Centers for Disease Control and Prevention in Atlanta recommend giving the Salk vaccine, made from an inactivated version of the poliovirus, when an infant is 2 months old and again at 4 months. This is followed by a dose of the Sabin oral vaccine, made from an altered, live virus, at 12 to 18 months and again at 4 to 6 years of age. If only the live vaccine is used, there is a small chance of getting polio from the altered live virus itself. The substitution of the inactivated Salk vaccine for the first two doses is believed to virtually eliminate this risk. People who become paralyzed by the poliovirus have major adjustments to make. Survivors must receive physical therapy to keep their muscles from deteriorating, and they may need leg braces to walk or have to use a wheelchair. Others may need help breathing for the rest of their lives. Some people overcome early paralysis only to suffer from post-polio syndrome decades later. But most survivors of paralytic polio have normal childhoods and go on to lead fulfilling lives. The violinist Itzhak Perlman, who caught the virus at the age of 4 and wears leg braces, is one example. Franklin D. Roosevelt (see box), who got polio at age 39, went on to become one of our greatest presidents. Another researcher, Albert Sabin, felt that using a weakened form of the live virus would provide greater protection than the killed virus used by Salk. Sabin's vaccine was cheaper to make than Salk's, and it was easier to take—people could swallow it rather than getting a shot, which meant that it did not require skilled health workers to administer it. Today children receive both vaccines as part of their immunization against polio. Neurons are constantly losing and making new connections, but in a balanced way, so that no matter how many connections are wearing out, there are always enough to keep the muscles working. But in the late 1970s, some of the people who had survived paralytic polio in the 1930s and 1940s began to complain of muscle and joint pain and of new muscle weakness. At first, physicians did not believe the complaints were real, but the number of patients kept increasing. In the 1980s, the term "post-polio syndrome" was coined to describe the condition. Post-polio syndrome is not caused by reinfection with the virus. Researchers believe that in these individuals, over time, the core, or axon, of their motor neurons may just wear out and can no longer make new connections. Or nerves may fail for other reasons. People who are affected by post-polio syndrome experience weakness, tiredness, muscle twitching, and pain. In addition, muscles affected by polio 20 to 30 years earlier begin to lose strength again. Unfortunately, no test exists to detect post-polio syndrome. The disease progresses very slowly, and treatment consists of exercise and aids such as braces or a wheelchair and assisted breathing when needed. Kehret, Peg. Small Steps: The Year I Got Polio. Morton Grove, IL: Albert Whitman, 1996. U.S. Centers for Disease Control and Prevention (CDC), 1600 Clifton Road, N.E., Atlanta, GA 30333. The United States government authority for information about infectious and other diseases. World Health Organization (WHO), Avenue Appia 20, 1211 Geneva 27, Switzerland. This group's website provides excellent information on the global polio eradication program. "A Science Odyssey: On the Edge: Paralyzing Polio." A short, entertaining introduction to the Salk and Sabin vaccines. Seavey, Nina Gilden. A Paralyzing Fear: The Story of Polio in America.